After trying out different selling apps and being active on Poshmark for a few months, I can say that this is definitely my app of choice when it comes to selling second hand clothing. Although they take 20% of your sale which is a lot compare to some of it counterparts, I like the platform and how they display the images more so I decided to stay with it. I also like how you can share your own listings or listings of others on Poshmark, it is a great way to interact with other sellers/buyers and help promote your items. It is like a marketplace with social media integrated into it (they even have a blog you can follow!). 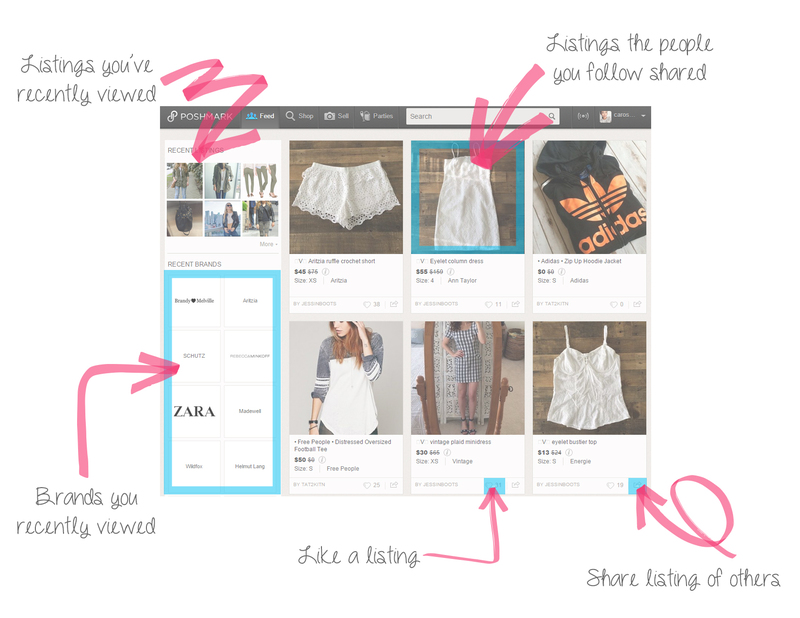 Below is a mini guide to Poshmark for those of you that want to start selling via apps or online but are hesitant! It is actually really fun and I hope this helps introduce you to one of the many apps out there and get an idea of what it is all about. On the top, you can find all sorts of shortcuts to different things. Feed is where you can see the listings shared by the people you follow. Shop is where you can find a list of brands in alphabetical order, so it makes it easier to search when you’re looking for something in particular. Sell is a function that can only be used on the mobile app for now, it is what you use to create a listing and sell, on the mobile app you’ll get to add pictures, descriptions, category and price for your listing. Party is something a little different, and is one of the things I really like about Poshmark! Everyday on Poshmark, there will be 3 parties. The first one of the day starts at 12pm EST and another at 3pm EST, these 2 are the more generic ones where you can share listings that match the brands or categories of the party. The last one starts at 10pm EST, it is theme oriented and there will be actual “hosts” hosting the party (hosts are poshers picked by Poshmark, so they’re usually different hosts for every party), this one is where your item will have the chance to get “host pick” which means the hosts will share your items and they will appear in a special section in the party page, the items that are picked will usually get a lot of exposures and shares from other poshers. It is a good way to sell and also a good way to shop for items because all the items in the host pick page have already been filtered and selected by the hosts. When you first sign on, you will see your home page that displays listings shared by the people you follow, it could be their own listings or listings of other people. You then have the option to share or like the listings you see. Sharing a listing from another posher’s closet will give them a notification saying that you’ve shared their listing(s), which usually they will help share yours with their followers (it’s kind of a you scratch my back and I’ll scratch yours). Liking a listing will save it to your “liked” list, which you can come back to it later should you decide to purchase. On the side you can also see a list of brands that you’ve recently searched for, this is a helpful little shortcut so you can just go to what you’re interested in instead of go through the whole list of brands. Your closet page is where all your listings are showcased. When you share a listing of your own, it’ll automatically put it at the top of your closet so you can refresh, change the layout and how your listings are organized accordingly. On the very top it will be a little area for you to put up some info about yourself, some sellers will list if they do trades or bundles on top, for me I just kept it simple – Where I’m located and my instagram account. 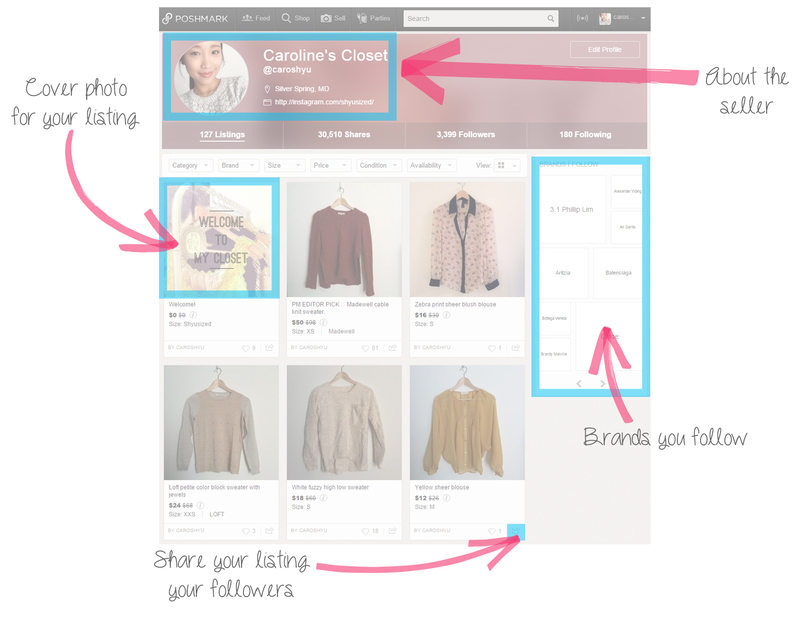 On the right side is a list of brands you follow, so when people visit your closet they can see what you’re interested in, and maybe discover a brand or 2 they’ve never heard of. Are you trying to sell some of the items in your closet to make more room or just pair down? There are so many apps out there to help you do that! Poshmark is my personal preference, but you should definitely explore and shop around all the possibilities out there, as one app might work well for some but not others. Hope this was helpful, and please share your thoughts as I would love to hear about your experiences on selling online using different tools and platforms! This is so helpful! I had an account, but I haven’t really used it. I’ll have to give it a try again! I’m glad you find it helpful! I had mine for a year before I become active on it. It was definitely scary at first worrying about things don’t sell and whatnot, but it really is fun once you get a hang of it! And most people are usually pretty willing to help you out if you have any questions. Good luck and don’t hesitate to ask if you have any questions once you start! That’s one of the reason why I started too because I wanted to clean out my closet. I’m glad you find this helpful, it’s really fun once you get a hold of how the site functions, good luck with your spring cleaning!